EPIC 7th Anniversary MONTH-Long Gallery Show and More! 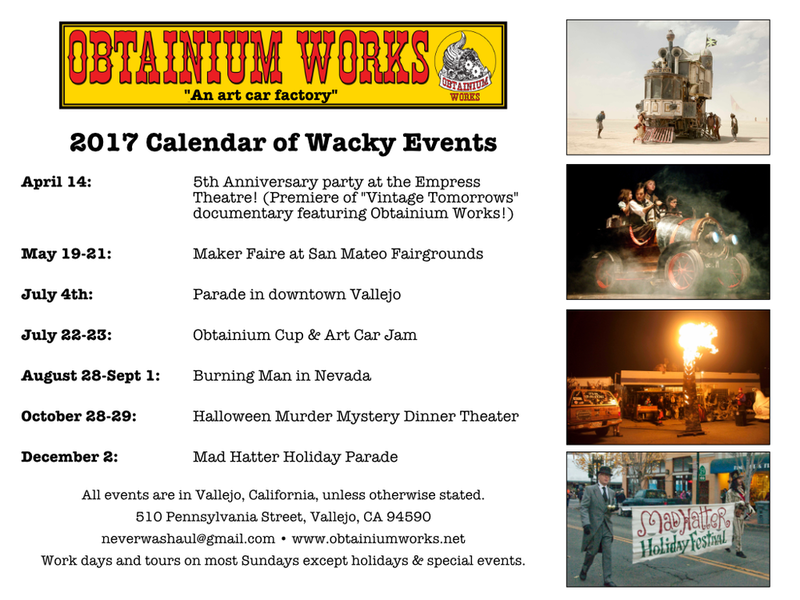 For the month of March, Obtainium Works is taking over Temple Arts Loft Gallery in downtown Vallejo for a gallery show! Ride art cars! Build stuff! Get drinks from a robot! Witness the glory of our fleet of over 15 art cars! Plus, on the weekends we will have live entertainment, food, and drinks! Friday March 8th, 6pm-10pm: Opening celebration! Steampunk vendors, art car rides! Saturday March 9th, 10am-2pm: Gallery opens. Ride art cars, kids crafts, photo ops. Sunday March 10th, 12pm-4pm: Gallery open. Friday March 15th, 5pm-8pm: Gallery open. 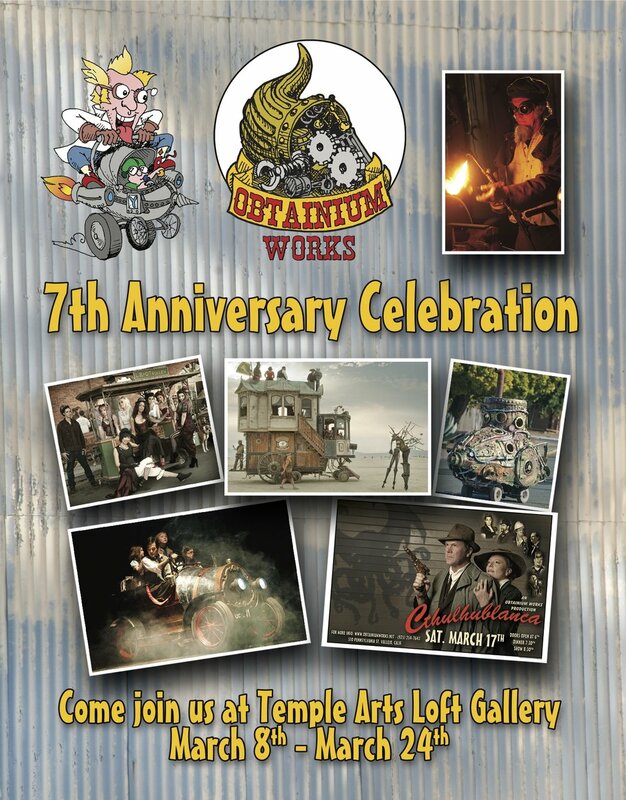 Saturday March 16th, 10am-late: 7th Anniversary Celebration! 10am-2pm: Ride art cars, kids crafts, photo ops. 6pm-8pm: Dinner at Provisions Restaurant. Click here to sign up for dinner! 5pm-9pm: Wrap party with drinks, appetizers, karaoke. Join the crew of Obtainium Works as they celebrate their 6th anniversary with a new play by Trevor Allen - Cthulhublanca (ka-thoo-loo-blanca). Based on the film noir movie, Casablanca, this tongue in cheek play follows the intrepid crew on their journey through the madcap world of Hibernia. Dinner, cocktails and show from 6pm-11pm (cost $75); Show only $35 (arrive around 8pm); Show begins at 8:30pm. Parking will be in the 500 block of Pennsylvania Street, which will be closed for guests only. Security will be on site, but leave valuables at home! Come in costume for whatever genre you like or choose something from the period or the steampunk world. Event will be held at 510 Pennsylvania Street, Vallejo, CA 94590. Cross street Napa and Sutter. 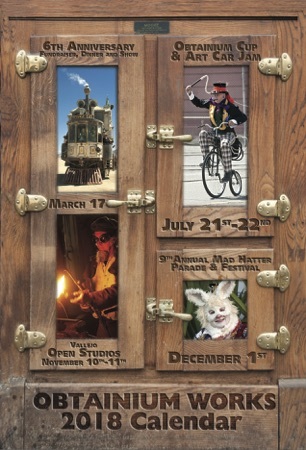 Vallejo Open Studios is a free, self-guided tour. Artists’ Studios and Galleries throughout Vallejo will be open to the public the second weekend in November, Saturday 11/11 and Sunday 11/12, 2017, from 11:00 am to 5:00 pm. UPDATE! The Halloween Murder Mystery Dinner has been cancelled! 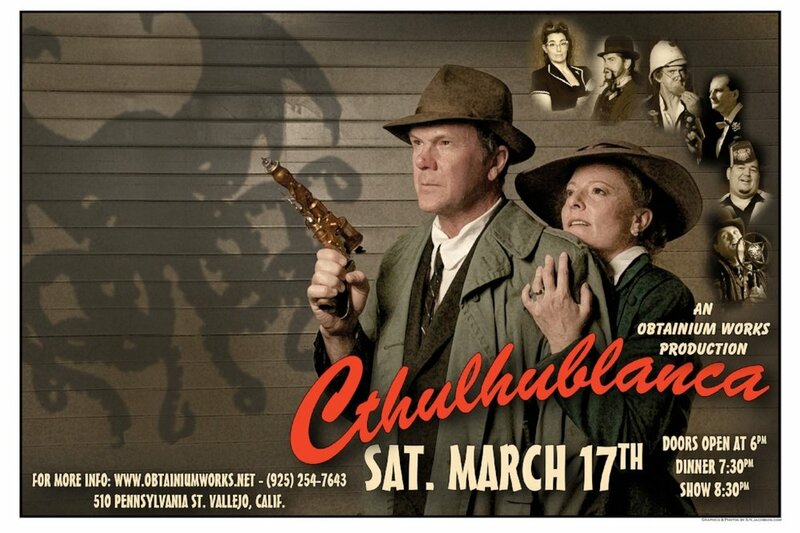 We will be premiering our play, Cthulhu-blanca, an original by Trevor Allen, at our fundraiser in the Spring. Stay tuned for info!